The time for considering New Year’s money resolutions is almost here. While you may mean well, research shows that not keeping those resolutions will cost you up to $1,000 each! 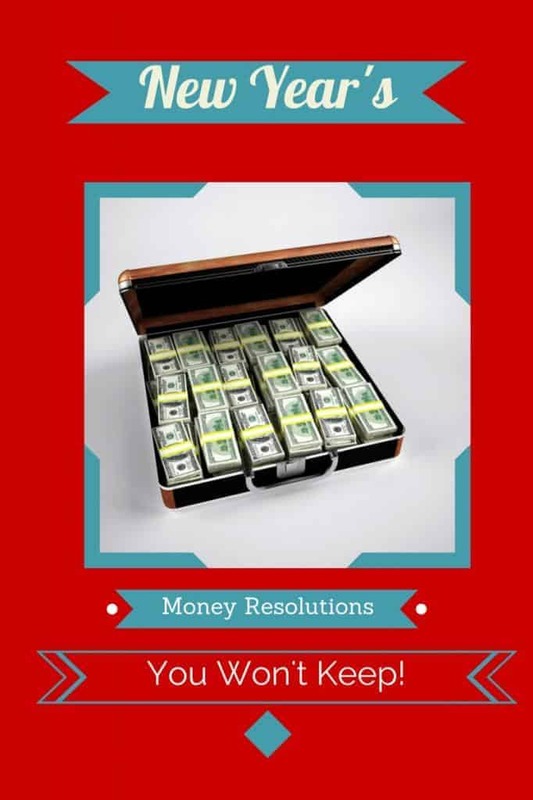 Here are 5 New Year’s money resolutions that you won’t keep and a few ways to make sure that you aren’t losing money trying to save them. I’m going to save more this year. This is one of the most popular New Year’s Money resolutions. It’s great in theory but lacks any plan or specifics. How much do you want to save? How much are you going to save in a certain time period? What are you saving for? These are all questions you need to consider. It is very simple to set up an automatic withdrawal from your paycheck each period. Since it’s gone from your paycheck before you see it, you likely won’t miss it. I’m going to spend less this year. Eliminating wasteful spending is always a good idea, but if you don’t know where or what you are spending, you are likely going to fail at this resolution too! There are so many places where you can save money, but first you have to know where you are spending it. Track your spending for a month or so, then look for ways to reduce it. If you spend a lot getting coffee on your way to work, consider making your own at home a couple of days a week. That way, you get your treat, but you still save money too! Every little bit adds up. I’m going to pay off my credit cards this year. Again, knowledge is power in this case. Know what you owe! Call your card companies and ask if they will reduce your rates. Paying more toward the principal owed on the card will help you get the balances lowered. Start with the smallest card and pay extra on that one each month. After that is paid off, move to the next card and so on. Once you have paid off the cards, don’t be tempted to use them again without either knowing you can pay it off when the bill comes or having a plan for paying it off within a few months. I’m going to improve my credit score. Good for you for knowing your credit score and wanting to make it better. Get your annual credit report and look for items that may be bringing down your score. Make sure that all information contained in the report is accurate. Then look for things that you can clear up quickly – a small balance that you may have forgotten or a payment that you can get back into on-time status. Be aware of how much debt you carry in relation to the income that you are producing. Many lenders are using both credit score and debt-to-income ratios now. I’m going to max out my 401(k). This is one resolution that you may be able to keep because you can set the percentage of withdrawal from your payroll checks, but the question remains – should you? If you haven’t set up savings to get you through lean times now, it doesn’t make sense to be taking more money out to save for later. Fund your 401(k) up to the point of any matching funds from your company. Then work to fund an emergency fund for up to 6 months of your expenses. Once that is in place, then contribute to a Roth IRA. Your final step then could be to add additional funds to those taxable funds. New Year’s money resolutions are easy to make, but not always easy to keep. These tips can help you from making money mistakes and arriving at the end of this year with no change in your financial situation. The most important thing to remember is that no matter what, you have to live within the confines of your income. It’s up to you to make the best use of those limited resources, but it can be done with careful thought and preparation. What are your New Year’s money resolutions? How will you make sure you stick to them? New Year’s Resolution is easy to start but quite challenging to complete. What a twist on your normal holiday resolutions you wil keep or should keep, etc. I don’t make resolutions during the New Year. I just never have been too into that. I love your post, thank you for writing it! I’m excited to get moving into 2015! This is a great way to gear up too! My biggest New Year’s resolution would be to lose weight. Thankfully I am all set financially. I like constantly setting long and short term goals, but I really don’t like resolutions. They always tend to be too out there. I don’t really make and stick with resolutions much. I do make them for my business but for life not so much! Our goal last year was to pay off our debt and we did it! This year we just need to stay that way! It is so hard for me to save money… I should start making my own coffee instead of buying it! It’s definitely hard to stick to those resolutions. For some of it you need a longer time frame to get it done. I find it hard to stick to my money resolutions. I make them at the beginning of each year like so many other people. I never make new years resolutions. I don’t need a calender change to change things I want to change in my life. I do not make New Year’s resolutions because I never keep them and then I feel like crap. Interesting points. I always try to spend less and save more, but also recognize that things happen and our savings takes a hit. I’m just glad to have something there when it does happen. I’ve never been one to set New Year’s Resolutions. But, I do set personal goals, then work diligently to reach them! I don’t make New Years resolutions when it comes to money. I make life resolutions in regards to finances, and so far they have seemed to stick. It helps that hubby and I are on the same page. I’ve given up on New Years Resolutions…because I don’t keep them. What I do, is set some reasonable goals, and reward myself when I reach them. LOL – I’m still working on my New Year’s resolutions. Spending less on eating out is on my list. I’m going to make a real effort to cut back on the spending. That shouldn’t be too hard. All I really have to do is cut out the store bought coffee and not buy my lunch so much. My resolution is to do a better job following through on my budgeting. I’m great at budgeting, but sticking to it is something else. All of these are so true. Instead of saying, “I’m paying off all of my credit cards,” we should be saying, “I’m going to pay down my credit cards.” It’s a doable statement. I stopped making resolutions many years ago. I have never kept one. You made some really great points! I hope I do a little better this year!